The Jesuit Missions of the Guaranis are the archeological remains of towns created by the Jesuit Order. The towns existed between 1609 and 1818, and aimed to socially, culturally and religiously elevate the local Guarani Indians. They also provided protection and economic stability. Originally there were 30 missions, spread out over Paraguay, Argentina and Brazil. The two Jesuit missions in Paraguay are now a separate WHS. San Ignacio Mini is the most popular of these 'Missions' (the locals more aptly call them Las Ruinas). I went there by public bus from Posadas. This trip takes over an hour, passing fine scenery of endless green fields and forests. I was the only one to be dropped off at the church of San Ignacio, and was given directions by the bus boy to get to my destination. San Ignacio is a sleepy little town, where the selling of souvenirs seems to be the main trade. Before entering the San Ignacio Mini complex, you first have to brave 250 meters of souvenir stalls. Entrance was free today (normally it's 25 pesos for foreigners). I don't know why I didn't have to pay, it could have been a holiday / a protest / a malfunctioning computer / lack of change or whatever. I've been in Argentina now for less than a week, and I've seldom paid any entry fees (I rode for free in the Buenos Aires metro for 3 days). The same observation counts for the double pricing system: they do tend to differ prices between Argentinians, Other Latin Americans and Other foreigners, but aren't strict in following this through: they just assume everybody is Argentinian. Personally I can't believe the money they're throwing away (especially at the Buenos Aires metro, which could use some new paint). Back to San Ignacio Mini - what kind of site is this? It was a small town with a church (of course), a large central square, houses for the residents (the Guarani) and other communal buildings. Now it is almost completely in ruins. The new life that has entered the ruined buildings did fascinate me the most - pretty and big lizards lazing in the sun, lots of birds, trees and plants taking over from the stones again. The site management tries to keep all ruined buildings 'clean', but I like it when nature claims it back. It's a very pleasant place to wander around for an hour or two, but I wouldn't be sad when it would disappear and become part of the jungle again. Tucked away in a North Eastern corner of Argentina are three Jesuit missions. The Jesuits were granted the rights to operate independantly from the local government by the Spanish crown. Their goal was to spread Christianity to the locals. But they also protected the natives from the frequent incursions of slavers and brought some progress to the area. Unfortunately, the right once granted to the Jesuits was eventually revoked as the king came to fear their independence. This was a trend across the whole of Europe. In the Spanish case the suppression came when the Spanish rulers tried to take more control of their possessions in the Americas. With the Jesuits gone the whole system quickly fell apart as the economic system failed and the towns were raided frequently by slavers. Eventually, the cities were abandoned and the natives returned to their previous lifesystle. These sites turned into ruins and were absorbed by the jungle. On my way to Iguazu from Posadas I managed to visit the three sites lined along Highway 12. They offer plenty of variety when it comes to the remains, the reconstruction and excavation..
Loreto: Nowadays covered in jungle this gives off a real Indiana Jones vibe. Some excavations were done, but they didn't do big restorations or clear the forrest. Loreto was also one of the largest Jesuit Mission, so I would definitively encourage you to make the trip here if you visit the missions. Santa Ana: In Santa Ana they cleared plenty of the forests covering the area, so it's not as original as Loreto. But it's not as reconstructed as San Ignacio Mini either. If you want to skip one mission this would probably be my candidate as it doesn't represent either extreme. On the other hand it's easier to reach by bus than Loreto as Santa Ana is the larger town. San Ignacio Mini: The most accessible and most reconstructed of the three sites on the Arginitian side. Placed directly in the town center there is no jungle covering the area. As I understand it some parts were also reconstructed. As such this is probably the most prominent example of the three. 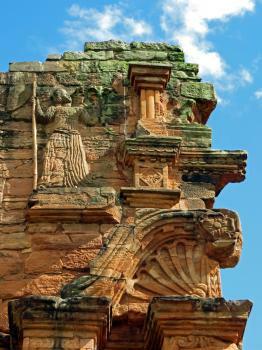 The most similar site is in nearby Paraguay, the Jesuit Mission of Trinidad. For anyone travelling the area, these sites may get washed away by the grandiosity of the Iguazu waterfalls, but you would be missing out on a fine site. In the meantime I have seen one more, San Javier in Bolivia, a Jesuit Mission of the Chiquitos. As mentioned in the review the Bolivian mission was in substantially better shape than anything in saw in Paraguay or Argentina with the original church and town planning still intact. San Ignacio Mini can be accessed from two sides. You have airports in Foz de Iguacu (Brazil) to the North and in Posadas (Argentina) to the South. There are plenty of busses running between Puerto Iguazu (Argentina) and Posadas. Make sure to get an express bus if possible as you will stop in every town along the road otherwise. Travelling to Santa Ana from San Ignacio Mini is fairly straightforward as Santa Ana is one of those stops along the highway from Posadas to Puerto Iguazu. Getting to Loreto, meanwhile, was a bit harder, as it's not a regular stop along the highway. There is a local bus that runs rather infrequently that you can take. Winking down a bus on the highway meanwhile (as indicated by some travel guides) is not possible. I failed for an hour so to get any bus to stop for me. Obviously, if you have made it to the Jesuit Missions you need to visit Iguacu/Iguazu. It's a pretty straightforward trip from San Ignacio Mini. And due to some quirks in the Unesco process it counts twice, once for the Brazilian side and once for the Argentinian one. 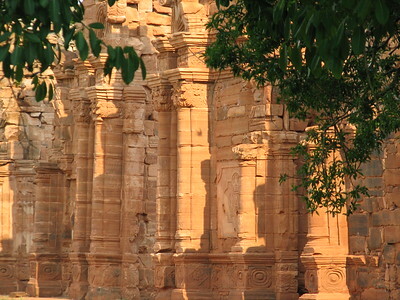 I would encourage you to also travel to the nearby Jesuit Missions in Paraguay. Due to some more quirks in the inscription process it counts as a separate site. You should be able to cross the border (and river) near San Ignacio Mini saving yourself the trip back to Encarcion and Posadas, but I could't figure it out at the time. One year ago on a snowy night I watched the 1986 movie "The Mission", which covers historical events that affected the Jesuit Missions of the Guaranís in much warmer South America. The film highlights the love of music the Jesuits and Guaraní shared; at many of the missions the Jesuits taught the Guaraní people European choral music, as well as how to make instruments. The film also highlights the fallout from the Treaty of Madrid in 1750, in which the Jesuit missions faced the ceding of territory from the Spanish empire, which ostensibly outlawed slavery of the Guaraní, to the Portuguese empire, which allowed it. It was with this context in mind that I visited the San Ignacio Miní mission near Posadas, Argentina, in March 2016. The Baroque ruins are in spectacular shape, and show how impressive the main church must have been when fully intact. Around the periphery of the site were the remains of long barrack-style buildings, storehouses, and workshops. The Guaraní here were not directly affected by the Treaty of Madrid, since they were in Argentine territory, but I feel for the Guaraní who had to fight for their security at the missions in Brazil. Logistics: The Jesuit Missions of the Guaranís can be reached by bus or private transportation in Argentina or Brazil. I took a day tour with a company from Puerto Iguazú to visit San Ignacio Miní. Last weekend I visited the Brazilian part of this WHS, that is São Miguel das Missões. I had previously visited the Argentinian ruins of San Ignacio Miní, and these two sites are probably the best preserved of all inscribed Jesuit Missions of the Guarani ruins (the Paraguayan ones are a separate WHS). The former São Miguel das Missões church has a remarkable façade and also a very interesting museum of guarani christian art, including a bell used when the mission was active. 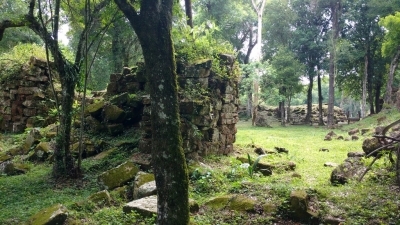 There are some other ruins nearby, worth visiting, but only the São Miguel ruins were declared WHS in Brazil. As far as the sound and light show is concerned I very much disagree with Davis C. Bales opinion. I saw the show in February 2010 and found it truly amazing! Excellent lighting, great effects and a good mixture between entertainment and information. I am a media engineer and have seen many multimedia shows before. And even with that background this show really stood out. So it looks like you have to go and see for yourself wether you like it or not. :-) The only thing that wasn't so great was that the mp3 player you get for other language versions didn't work properly. But still I loved the show! How we got there: We took a bus from Iguazu to San Igancio. What you read in various forums is true: It is really no trouble at all to simply walk into the bus station and buy a ticket to go to San Igancio. Buses leave every hour or sometimes even more often. They drop you off right in front of the tourist info which comes in handy aswell. There we booked our next busride to Salta with Flecha Bus. Oh, one more thing: If you use long distance buses, always put your luggage in a waterproof bag or something. Water from the aircondition flows on the luggage. One of your bags was soaking (with all clothes inside dripping wet). It also helps to ask the guy who loads your luggage into the bus to put it somewhere dry while you give him an extra tip. I visited some 20 Jesuit mission sites in Paraguay, Argentina, and Brazil, including San Ignacio, Loreto, Santa Ana, and Sta Maria la Mayor. There are other mission sites in the region that need protection and the support that inclusion on the UNESCO World Heritage Sites lists confer. At the top of the list I would include several mission sites in Brazil, particularly San Lorenzo Martir, and San Cosme in Paraguay. Other sites, such as Corpus Christi and Martires, need protection and rehabilitation. San Ignacio Mini is well worth the visit for anyone at nearby Iguassu Falls, whether on the Argentine or Brazilian side. Though there are guided tours available from Iguassu, driving on your own is quite easy. It is possible to drive to San Ignacio and back in the same day though spending the night adds to the experience. However, the town offers few accomodations, the best of which are hard-pressed to earn a 1-star rating. From Buenos Aires it is not so easy to reach Argentina's State of Misiones. On certain nights there is a sound and light show. The slightest hint of rain and the show will be cancelled; the equipment is simple and not water resistent. So, as can be expected, the show is rather primitive and its simplicity could hardly be expressed as charming. Boring may be a better descriptive. The lighting is uneventful and the sound is a recorded narration (in Spanish) of the mission's history with some music of the jesuit-educated natives as a background mixed with some booms and crashes to depict the battles with they fought with the Brazilian slave traders. Not emotionally stirring! In the summer it is barely dark when the light show begins, reducing even more the already limited effect. Needless to say, it was a disappointment and one should spend the night to experience the simplicity of the village and not for the light show. But catch it if you are already there and reach your own conclusions. All that said, I would recommend making the effort to visit San Ignacio Mini to anyone with an interest in South American history or who enjoyed the 1986 Academy Award winning film "The Mission" starring Robert DeNiro, Jeremy Irons and Liam Neeson. Walking tyhrough the mission's grounds is walking through history. In the past 2 years I have made the trek twice by motorcycle from Rio de Janeiro and have a feeling I will return. Ideal City: The towns and the way people lived and worked together was seen as utopian by some. Italian Architects outside Italy: The Italian architect Juan Brasanelli constructed the church at Ignacio Mini.